Ghee vs. Butter: Which is the Better Choice? Ghee is a traditional cooking fat similar to clarified butter, and it has been around for thousands of years. Especially prevalent in South Asian cuisine, it is made by removing the milk solids and water from regular butter. This article looks at the differences between ghee and butter regarding nutritional composition, taste, and health benefits. The aim is to answer one question; which is the healthier choice? What is the Difference Between Ghee and Butter? The most significant difference between ghee and butter is that the former is 100% fat. This contrast is due to a natural heating process which separates the fat in butter. During this procedure, the water content evaporates, and we can skim the milk solids out of the liquid. Following this process, only the pure butterfat—ghee—is left. See this full guide to ghee for more information. As shown in the table, compared to butter, ghee has more calories and fat and contains zero carbohydrates or protein. The total calories in butter are also much lower due to the water content (approx 17%) which is not present in ghee. The micronutrient profiles of both fats are almost identical, and both contain beneficial fat-soluble nutrients such as conjugated linoleic acid (CLA), vitamin A and vitamin K2. The only (very slight) difference is that ghee has a marginally higher amount of vitamins and minerals. This is because it is a more concentrated source of butterfat. Key Point: Both fats are nutritionally similar. However, ghee is a purer source of fat and therefore contains more calories. As ghee doesn’t contain heat-sensitive milk sugars or proteins, it is much less likely to burn than butter. As a result, ghee is much better suited to deep frying than butter. Key Point: Both make great cooking fats, but ghee is the best choice when cooking at high temperatures. Lactose intolerance is a global issue, and recent estimates put 65% of the world population as lactose intolerant after infancy (5). Lactose is a dairy sugar, and it exists in foods like milk, cheese, and butter. Although butter only has a minimal amount of lactose compared to milk, it is enough to cause symptoms. On the positive side, the ghee production process fully removes this lactose. There is also the small matter of casein; a dairy protein that many people are allergic or sensitive to. While butter is less than 1% protein by weight, even trace amounts of casein can cause problems in those with an allergy. As ghee is pure butterfat, it contains no casein. Key Point: In contrast to butter, ghee is pure butterfat and does not contain dairy proteins or sugars. Therefore, it is a viable alternative for those with allergies or sensitivities. Comparing these two fats in the flavor department isn’t easy. In truth, both fats impart a delicious taste in food. Although ghee has a ‘buttery’ taste, it tastes less creamy than butter, and it’s easy to realize the milk proteins aren’t present. Ghee has a mildly nutty taste, and it is deeper and richer than butter. Which of these two tastes people prefer goes down to individual preference. Personally, I would probably say ghee is the better tasting… but I love the taste of butter too. Key Point: Butter has a creamier feel, but ghee provides a richer flavor. Picking a winner in the taste compartment is hard. One clear advantage that ghee has relates to storage. Ideally, butter should be kept in the refrigerator as it can only last a few weeks at room temperature. However, as ghee no longer contains water or milk solids, it is much more shelf-stable. As a result, it can be stored in a kitchen cabinet for several months and doesn’t need refrigeration. Although this doesn’t matter too much logically, the main benefit is that room temperature butter/ghee is easier to spread. Key Point: Butter should be kept in the fridge, but ghee doesn’t have to be. Another important consideration is how much both dairy fats cost. A quick search on Amazon shows prices of approximately $20 for one pound (454g) of ghee. If you shop around, then you can likely find it for cheaper, but it’s still a lot more expensive than butter. I love ghee, but there’s no question it’s overly expensive for what you get. For example, if you have some butter then it’s so simple to make your own at home and it only takes 15 minutes. Is that worth the price retailers charge? Key Point: Pitted against butter, ghee cannot compete on a price level. It’s much more expensive, and on average, it costs at least twice as much. Now we know the major differences, but what about their effect on our health? There are claims that ghee (and not butter) contains oxidized cholesterol, and others say that only butter raises our LDL cholesterol. 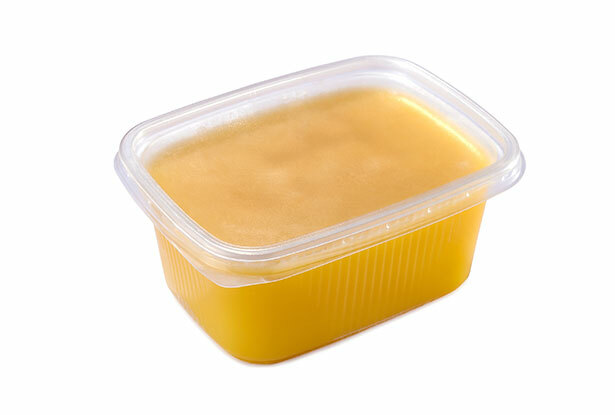 Ghee has been found to contain cholesterol oxidation products (COP), which are detrimental to heart health and may promote cardiovascular disease (6). However, this doesn’t automatically make it bad for us. For one thing, there isn’t lots of research in this area, but the study where many of these claims come from re-heated ghee several times over different days (7). It’s common knowledge that re-heating cooking fats over and over causes them to break down. Another key point is that the ghee did contain “a small amount” of COP even before it was first heated. But again, many things can cause the oxidation of cholesterol. Heating butter at extreme temperatures will cause oxidation products to form – as will poor storage, and exposure to excessive heat and light. Key Point: Ghee may contain a small amount of oxidized cholesterol, but this likely depends on the production and the temperatures used. 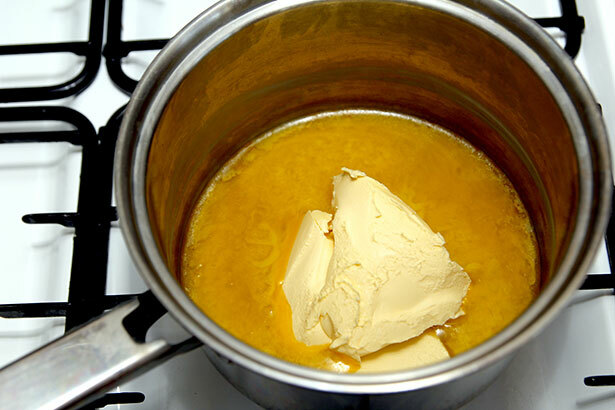 Homemade ghee through heating butter at a low temperature is unlikely to form oxidized cholesterol. A vast number of studies are skewed by lumping groups consuming ghee and groups consuming “vegetable ghee” together as one. “Vegetable ghee” is otherwise known as Vanaspati, which is an industrial fat containing up to 50% trans fats (8). Studies which presume ghee and trans fat have a similar effect are obviously very silly, but that’s the way it is. Fortunately, more intelligent studies exist, and they show that cardiovascular disease prevalence goes up in groups who use animal ghee and vegetable ghee. However, in people consuming only animal ghee, there is a lower risk of cardiovascular disease (9, 10). Furthermore, data shows that the epidemic of cardiovascular disease in India started a few decades ago when traditional fats like ghee were replaced by omega-6 oils and vegetable fats (11). Key Point: Despite concerns over ghee and heart health, studies which differentiate between butterfat ghee and Vanaspati show health benefits. 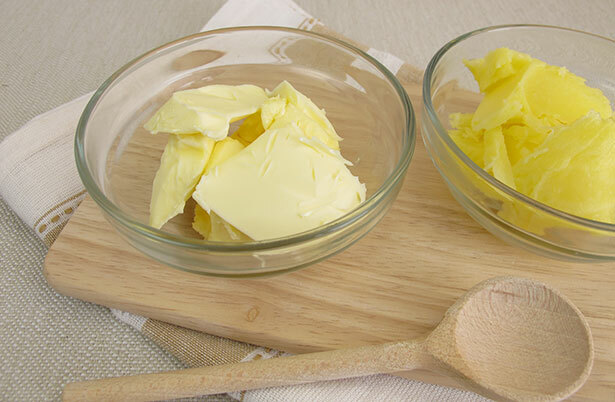 Does Butter Raise LDL Cholesterol More Than Ghee? Some view ghee as a healthier choice than regular butter. Because, apparently, regular butter can raise our LDL cholesterol levels more than ghee can. Consuming ghee as 10% of daily calories results in significant increases in HDL without considerably increasing LDL or triglyceride levels (12). In one study, 47 healthy participants added 16.6 grams of butter to their daily diet for five weeks. The result was an average increase in LDL cholesterol of 5.6% and a similar increase in HDL (13). Another study fed ghee and butter to rats in a human equivalent dose of 40 grams per 70kg bodyweight. Although both butter and ghee groups experienced increases in HDL and LDL, the rise in LDL levels was much higher in the butter group (14). In short, larger doses of butter and ghee seem to affect cholesterol profiles to a greater extent. However, if you are using both as a condiment—as they should be—then any large change in lipid levels is unlikely. It’s also worth considering that the idea of “good cholesterol vs bad cholesterol” may be over-simplified as a cardiovascular risk factor. For instance, many prominent scientists feel that LDL cholesterol alone may be an inadequate marker for cardiovascular risk, and that the LDL particle type, ratio of non-HDL to HDL, and ratio of HDL to triglycerides are all important to look at (15, 16, 17). Key Point: Studies suggest that butter increases LDL levels more than ghee does. However, both butter and ghee increase HDL too. However, in reality, there isn’t much to worry about. In reasonable amounts, it is unlikely that butter would have a significant impact on the cholesterol profile. In addition, butter is also associated with increasing HDL—which is likely a positive. The (possible) small traces of oxidized cholesterol in ghee are also unlikely to cause harm. In reasonable amounts, all indications point to both playing a healthy role in the diet. Key Point: Butter and ghee are evenly matched in the health stakes. However, the latter holds a slight advantage because some people are sensitive to the lactose/casein in butter. As mentioned earlier on, it is possible to make homemade ghee in approximately 15 minutes. Should you wish to give it a try, here are some instructions on how to make it. Take a stick (or two!) of butter and chop it into small pieces, so that it will melt quicker and more efficiently. Next, add the pieces of butter into a pan on medium heat. Stir occasionally and move the butter around to keep it from burning until it becomes fully liquefied. After a few minutes, you will start to notice the surface bubbling and then foaming. Reduce the heat and simmer on a low temperature. At this stage, leave it to simmer and carefully watch the butter. Slowly, the foam on top will dissipate. You will start to notice milk solids separating from the butter and raising to the top of the liquid and sticking to the sides. Knock these milk solids (they are a reddish-brown color) from the sides and occasionally stir to stop them from burning. Keep the butter simmering until you see it start to foam for the second time. Once the butter begins foaming again, take the saucepan off the heat. Line the inside of the sieve with the cheesecloth and hold it over your bowl. Pour the contents of the saucepan into the sieve and the pure butterfat—ghee—will strain right through into the bowl. However, the strainer will catch the milk solids. You will now have a bowl of liquefied ghee – it has a brilliant bright golden color deserving of its nickname ‘liquid gold’. Move the mixture into your jar(s) and leave to cool at room temperature until it slowly hardens. Tip: Adding some herbs at this stage will infuse their flavor into the ghee. Some popular options include garlic, sage, thyme, and rosemary. Key Point: Ghee is pretty expensive in the shops, but in reality it’s very easy to make at home. If you prefer to buy the finished version, then you can buy it from most grocery stores and supermarkets. Although it is also available from specialist health stores, you can expect to pay a premium. You can also buy a huge range of ghee products online. Butter versus ghee is a fairly even contest with no clear winner. As a result, we have to consider which of these two dairy fats suit our personal preferences. Which has the better taste? Are there any issues with lactose or casein? Weigh up the pros and cons and go with whichever one has the edge. At the end of the day, both ghee and butter are delicious natural fats that are good for you. And they are certainly healthier than margarine blends of canola oil and soybean oil. wow, i haven’t seen some thing like butter becoming ghee, thanks for sharing this unique recipe of ghee.